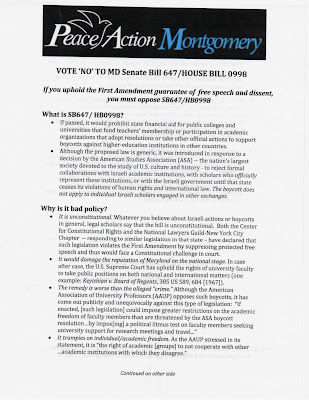 Peace Action Montgomery distributed flyers at the forum (see page 1 above with 2 and 3 below) arguing strongly against the bill as unconstitutional and just plain wrong. Although many in the audience opposed the bill–no one in the audience expressed support–the bill is not on Progressive Neighbors’ very lengthy priority list. 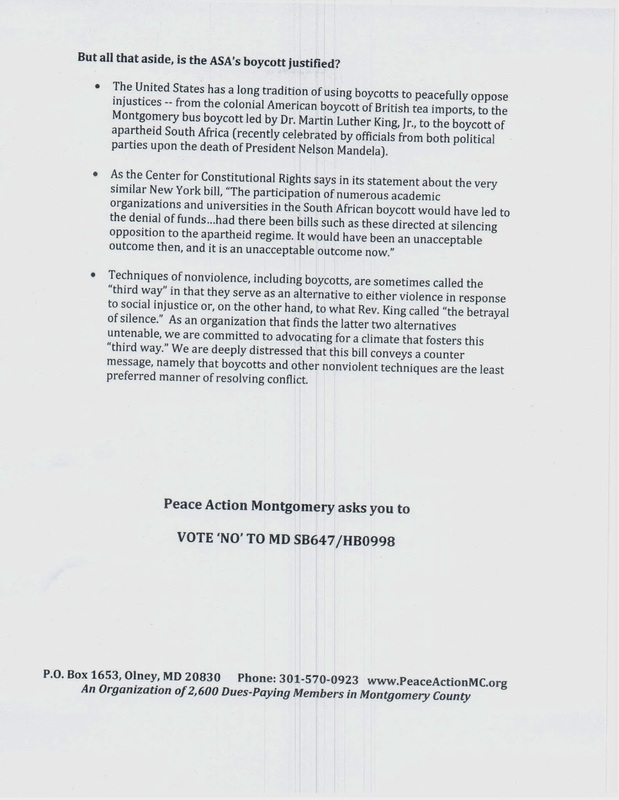 There is a certain irony to Peace Action Montgomery’s opposition to the bill. The boycott’s proponents handed out flyers lauding the long history of boycotts to promote social justice from India to South Africa . 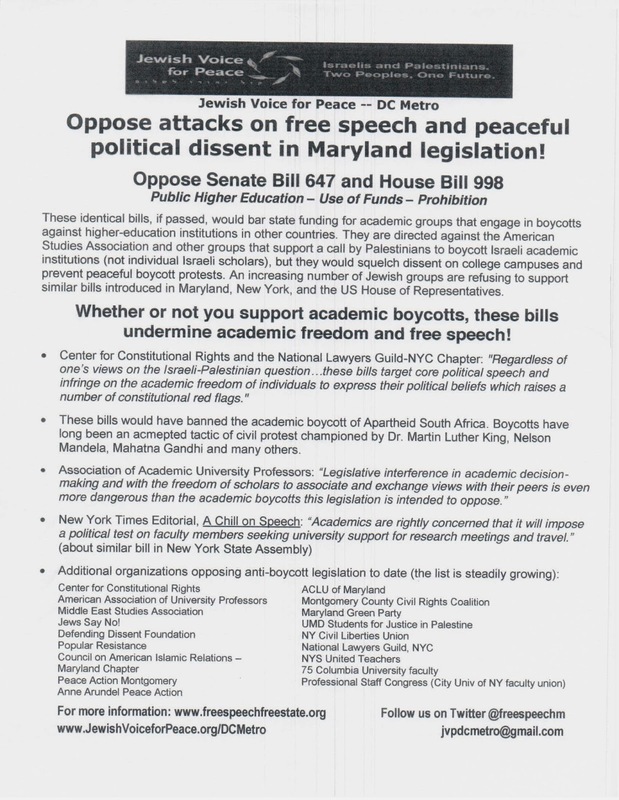 . . in order to condemn the proposal that the State of Maryland boycott ASA as a statement in support of its view of a more just world. 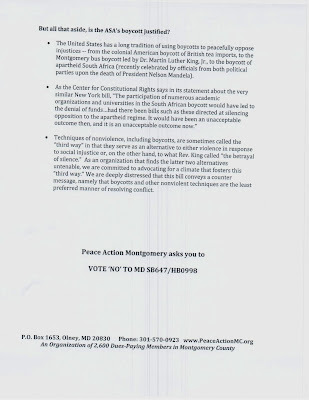 Thought experiment: What would Peace Action Montgomery’s response be to a proposed ASA boycott of HBCUs? The arguments that the bill violates academic freedom are specious. 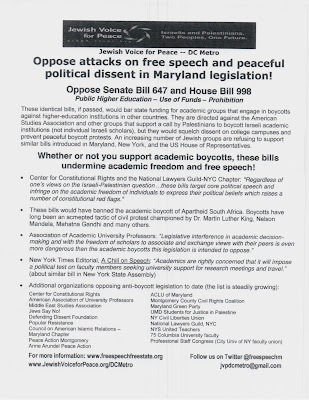 The proposed legislation would not ban any professor from supporting ASA’s boycott, attending ASA conferences, or membership in ASA. It just wouldn’t permit Maryland institutions to pay for it. Universities regularly decide which scholarly activities they deem worthy of support. We may not agree with them but the State has a right to decide how to spend its money and which endeavors to support. This issue has a profound potential to alienate Jewish Democrats and other supporters of Israel. I believe heavy majorities of Jewish Democrats strongly support, even yearn for, a negotiated peace between Israelis and Palestinians. Secretary of State John Kerry is working doggedly to address the real barriers to a workable and lasting peace despite extreme difficulties. Nonetheless, ASA’s efforts to isolate Israel offend deeply and undercut them. Jews may not be unanimous on this issue (we seem incapable of it; just watch either the Knesset or Life of Brian) but the vast majority strongly oppose efforts to boycott Israel. Jews are passionate for peace and for Israel. Trying to make them choose is a losing strategy. I don’t think legislators or candidates are going to find it easy to straddle this issue.